Disclaimer: The following bite is my perspective on what makes NIO an attractive investment; this is not an endorsement or a recommendation for traders to buy the stock. NIO (NIO) shares are trading at $4.96, down -7.29% from yesterday. As the stock is hitting its lows, traders are wondering whether it might be a good time to invest in NIO? Let's look at the economic headwinds first. As the Chinese government is lowering its renewable energy vehicles subsidy by as much as 50%, it has also reveled a plan to scale back the subsidy completely after 2020. Local Chinese governments are also being asked to pull back on subsidies as the Ministry hopes local manufacturers ramp up innovation to keep competitive. The macro landscape certainly looks bad. But it can't be all that bad. What is here to like about NIO as a stock to potentially invest in? 1. NIO stock price is at its 52-week low. Over the last month, NIO (NIO) returned -22.94%. This might be a good opportunity to buy the dip. 2. NIO (NIO) average analyst price target ($8.63) is 73.99% above its current price ($4.96). 3. The demand for the electric vehicles will be high in the next few years. NIO was able to beat its ES8s delivery target in 2018, and its revenue growth has been very strong. 4. NIO's lower-priced electric vehicles will attract a lot of interest from Chinese and emerging market consumers. Those will be huge markets for electric vehicles. Despite those good news, the bears are now dominant among potential NIO investors. In addition to the economic and policy headwinds in China, there are significant concerns about NIO car quality and long-term prospects. Here is what the bears have to say. 1. In order to grow internationally, NIO should increase the driving range of its vehicles, which today is only 154 miles for the ES8 make. 2. NIO does not manufacture cars; all production is outsourced to JAC Motors. Furthermore, the company opted to NOT build a factory in China after reporting a heavy loss in Q4. 3. 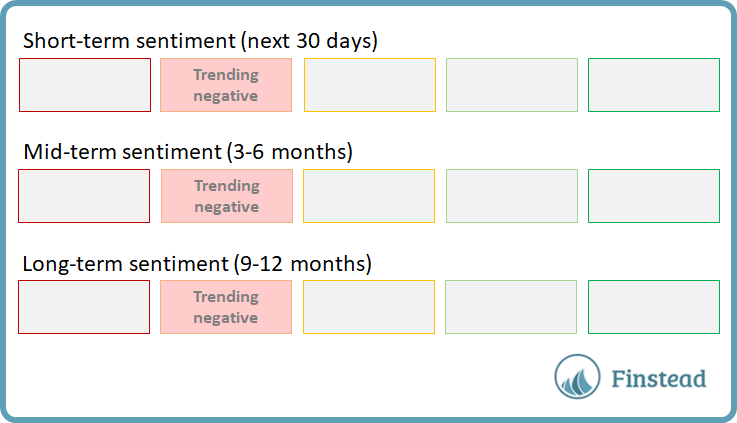 The negative sentiment towards NIO is significant. NIO short interest (days to cover the shorts) ratio is 3.81. The stock garners more short interest than the average industry, sector or S&P 500 stock. Want the the latest analysis and information on NIO? Please visit Finstead and ask for "NIO", "NIO analysis" or "NIO news". 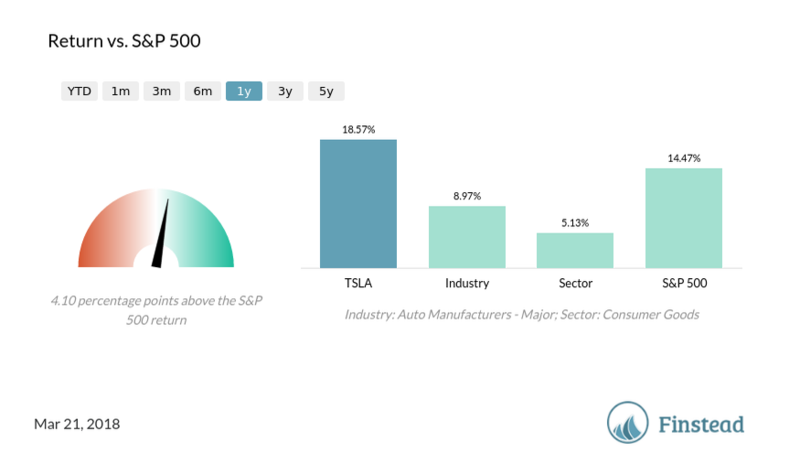 Tesla (TSLA) stock prediction: will the positive momentum continue? Tesla Motors, Inc. (TSLA) shares are trading at $324, down 3%. The company announced its quarterly earnings last Wednesday after market close, after which the stock price massively shot up. What's TSLA stock price forecast now? Last Wednesday the company reported outstanding third-quarter results and caught many investors off guard last. The profit was massive: $312 million. This was just the third time in the company's history that it has reported a quarterly profit; the company also set a new earnings record. Tesla is making headways in vehicle delivery: last quarter it shipped 56,065 Model 3s, up from 18,449 in the second quarter. Total company deliveries were 83,775. The demand for Model 3 looks outstanding; order cancellations from the original August 2017 reservations (totaling 455,000) are now below 20%. Over 50% of vehicles traded in for a Model 3 were vehicles priced below $35,000 when they were new. This implies that many consumers are paying more than normal to buy a Tesla Model 3, which is a good sign for brand equity and future demand. Anticipation should continue to build for the company after it unveils Model Y crossover next year; however, Model Y won't be available until 2020. 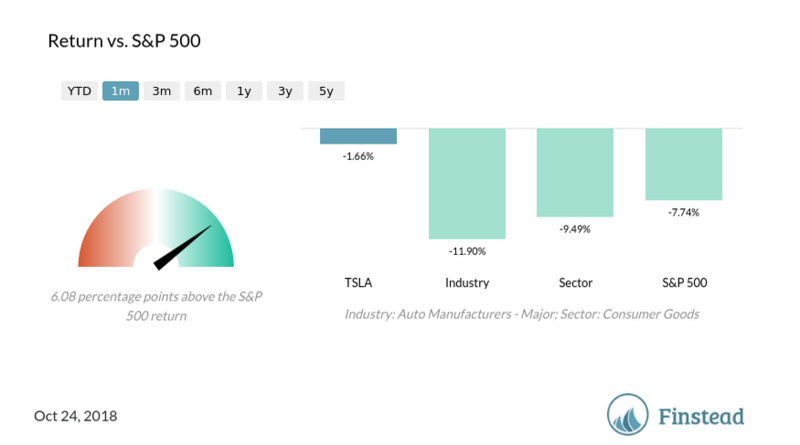 Over the last month, Tesla Motors, Inc. (TSLA) returned -1.66%. 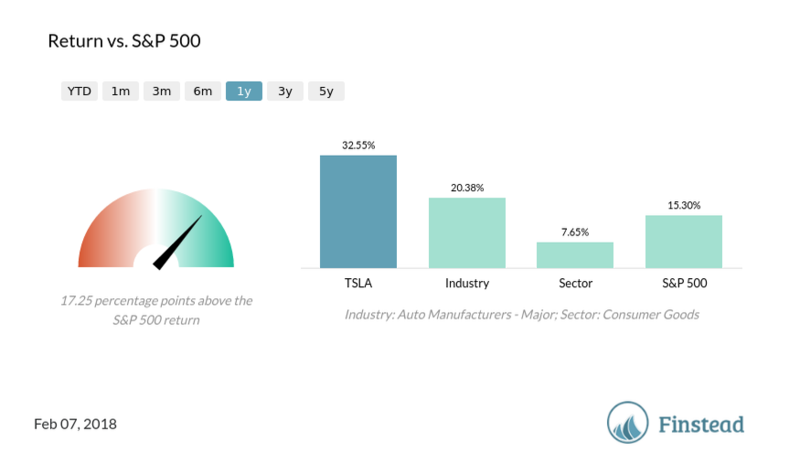 Tesla Motors, Inc. (TSLA) forward P/E ratio is 80.62, and it’s high compared to its industry peers’ P/E ratios. Tesla Motors, Inc. (TSLA) short share of float is 28.65%. The stock is much more frequently shorted than the average industry, sector or S&P 500 stock. Tesla Motors, Inc. (TSLA) average analyst price target ($319.73) is 8.7% above its current price ($294.14). For the latest price and information on Tesla Motors, Inc., please visit Finstead and search for "TSLA price" or "TSLA news". 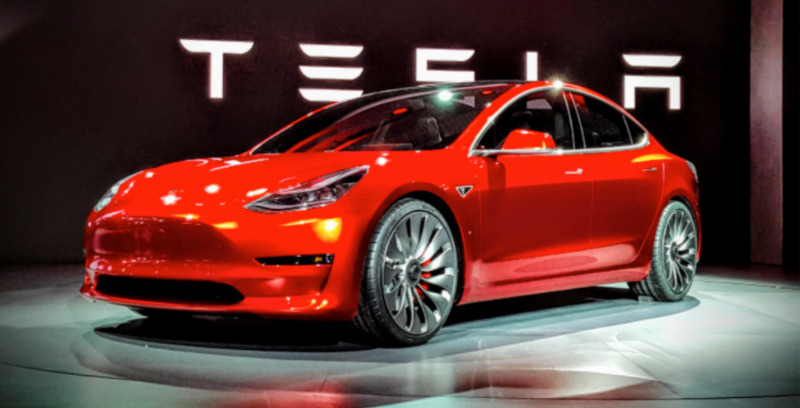 Tesla (TSLA) earnings preview: trouble with the mass market? Tesla Motors, Inc. (TSLA) is expected to report earnings on August 1 after market close. The report will be for the fiscal quarter ending June 2018. Shares are trading at 297.43, down -1.9%. What are TSLA earnings expectations? What news should investors be paying attention to? Investors are spooked by the comments CEO Elon Musk made in a Bloomberg interview on July 13. While speaking about the Model 3 as a "bet-the-company" situation, given the large step-up in production required, Musk said, "Once we break through to mass-market cars, where mass-market is on the order of a quarter million vehicles per year, I cannot see us doing a 1.2-million-vehicle program of one particular model." Given that Musk was talking about mass-market volume at around 250,000 units a year, some analysts judged that his comment above meant that the Model 3 will never be close to the range of 1.2 million annual units, causing them to revise their forecasts for the company. What Tesla will look like 10 years from now is still highly uncertain. Over time some of the Model 3 demand may move to other variants such as the Model Y crossover derived from the Model 3 platform, or to vehicles not yet announced, such as a pickup truck and a compact car. Tesla's mass-market ambitions over the next decade may be much smaller than analysts had previously thought, which causes a concern for some investors. 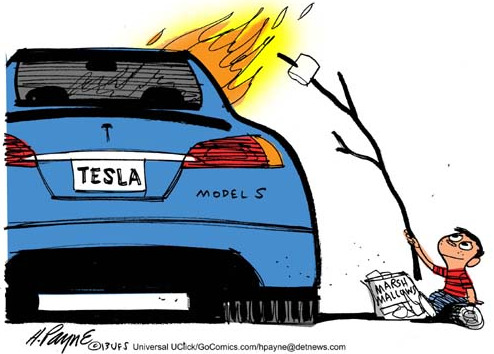 Also noteworthy is that The Wall Street Journal reported that Tesla has made a request of some suppliers to refund payments for parts back to 2016 in order to help Tesla become profitable. Automakers often have brutal pricing demands on suppliers for future work, but retroactive rebates are not common in the industry and sound troubling to investors. Beat analyst EPS estimates by 2 cents ($-3.35 actuals vs. $-3.37 forecast) in FQ1’18. 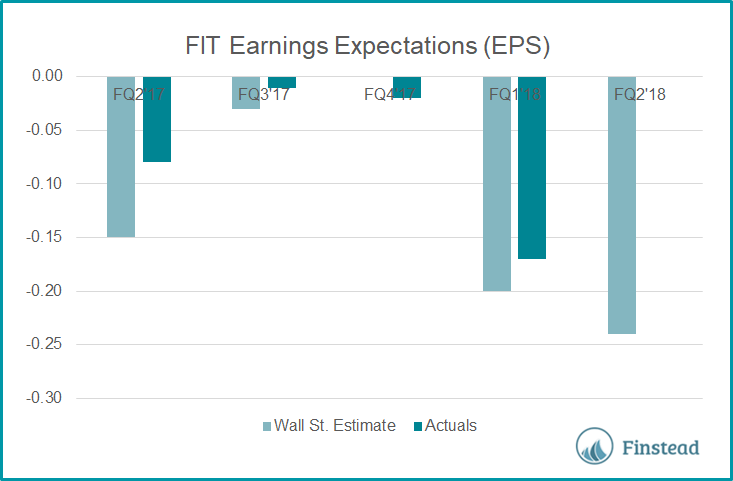 For FQ2’18, EPS is expected to decline by 103% year-over-year to $-2.70, while revenue is expected to grow 38% year-over-year to $3.86 billion. 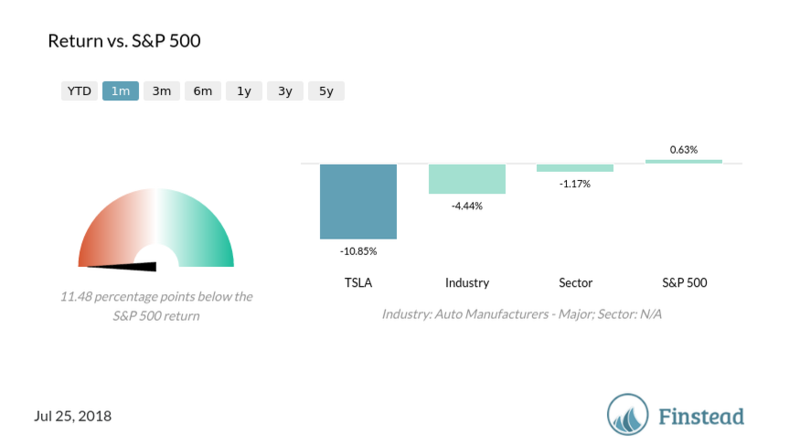 Over the last month, Tesla Motors (TSLA) returned -10.85%. Tesla Motors, Inc. (TSLA) average analyst price target ($312.32) is 5.01% above its current price ($297.43). GM: Will The Stock Move Higher? 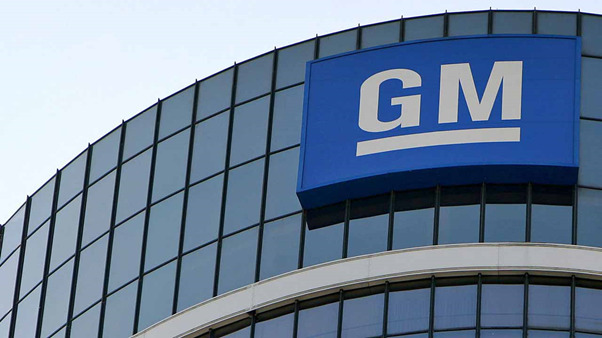 The General Motors (NYSE: GM) stock moved up about 1% today. The automaker lost some value in the broader market correction. What is the forecast for this stock? Here is what you need to know about GM today (for the latest stock news go to Finstead and type 'GM news'). The company has witnessed a lower sales growth. 79 million cars were sold in 2017. The company forecasted 81.6 million for 2018, which is just a 3.3% rise. The domestic auto market in the US is in an almost stagnant condition since 2015. Though China is a huge automotive market, it doesn't have much-needed consistency. Also, President Trump's geopolitical play might further destabilize the General Motors stock. Tesla's incident involving a deadly crash (because of its autopilot feature) has caused a negative impact on the whole auto sector. GM incurred an $8.1 Billion R&D expenditure last year, which was the highest in the world. This was done to pursue the industry opportunity. But the driverless vehicle is preferred by only about a half of various surveys’ respondents. Consumers’ negative perception of the driverless car can definitely cause the GM stock to further decline. The declining demand for the Spark minicar led the Company to a decision to replace it with a crossover. Spark faced a 36% dip in sales in the US market alone last year. In February, GM had plans to shut down a South Korean factory and consider 3 other plants' operational viability in the region. The South Korean government's support and concessions for its local union are the factors on which the crossover production plan depends (this model is tapped for production in 2020). What are the chances of the GM stock climbing further up? Per Finstead Research, the GM stock has an average price target of almost $49. It has an upside of around 28%. The General Motors stock has a fairly low valuation. 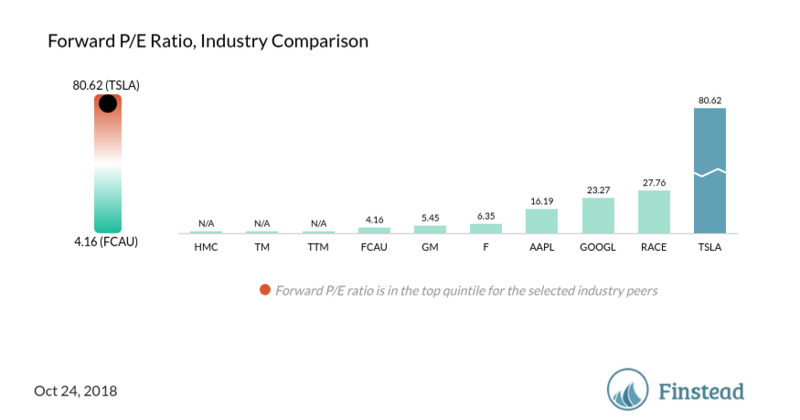 Its forward P/E ratio is ahead of that of FCAU but behind those of PCAR, OSK, and WBC. Elon Musk's Stock Options: Good or Bad for Tesla (TSLA)? Tesla's shares are up by 2% today, almost wiping off the losses for the year. Elon Musk got what he asked for today: the shareholders approved to grant him stock options worth $2.6 Billion. This will be possible if Tesla manages to sustain its growth trajectory in the upcoming years. Some of the Tesla's major investors are of the opinion that the award is necessary for gearing up the business. Per new plan, the options will be earned for the fulfillment of goals related to the market value, revenue, and earnings. In order for Musk to get all the options, Tesla's market cap has to be $650 Billion, which is more than Facebook’s market cap, and its revenue has to be more than P&G’s revenue. If Tesla succeeds in accomplishing those goals, Musk will get more than $50 Billion in equity grants. Some critics hold a negative opinion towards this plan because it increases the company's expenses and dilutes the existing shareholders' stake. Musk's involvement in various other projects creates concerns around his lack of commitment to Tesla, but the award ensures he’d be in a driving seat for a decade. Finstead doesn’t predict much of an upside for Tesla's price. According to Finstead research, Tesla’s average price target is around $317. Tesla’s valuation is negative because the company is not profitable. Trading shares of unprofitable companies is a highly speculative activity. Tesla's Short Share of Float is higher than the average for the industry which means the share price is likely to be volatile. Over the last year, TSLA returned +18.57%. 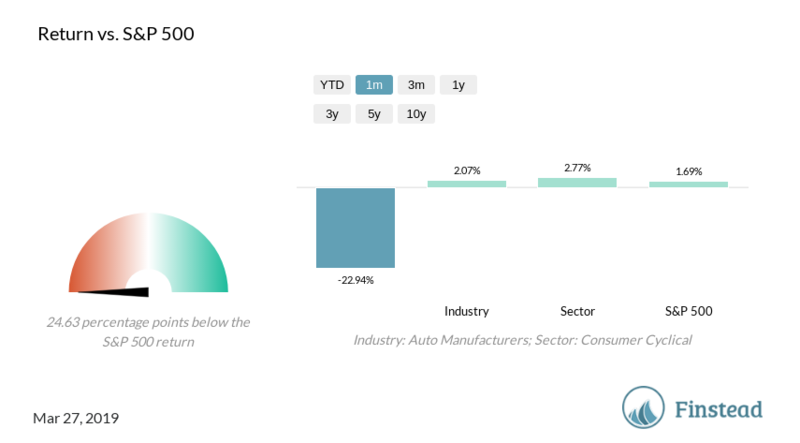 This return is higher than the Auto Manufacturers sector (8.97%), Consumer Goods industry (5.13%), and S&P 500 (14.47%) returns. Tesla (NASDAQ: TSLA) is up 2% mid-day today ahead of its earnings report post market close. 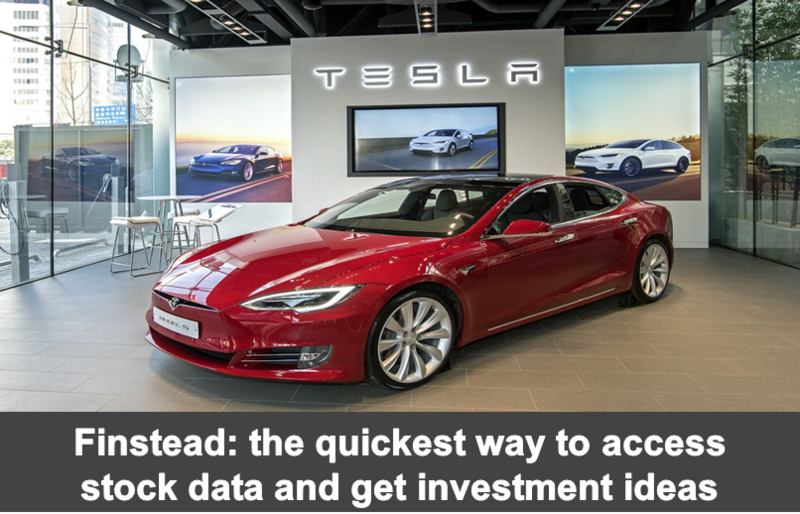 Based on Finstead research, TSLA price target upside is -9.04% (visit Finstead and type "TSLA upside"). Here are some things you should know about Tesla prior to the earnings release. Tesla is far away from a profitable company. Per Elon Musk, profits can be realized only after Model 3 enters full-scale production. Investments in new vehicles development, technologies, and retail network build-out are the reasons for anticipating losses. Production bottlenecks have led Tesla to miss its target of 1500 Model 3s in 2017. Tesla's dependency on a single source to obtain components is limiting its production capacity. The lithium-ion battery also remains a problem. In order to meet the demand and sustain high growth, Tesla is investing in Model X and Model 3 development, Gigafactory construction, sales expansion, as well as building supercharger infrastructure. Investors continue to be dubious regarding Tesla's SolarCity acquisition as they feel that the debt and cash flows of SolarCity would further deteriorate Tesla’s financial position. The acquisition of SolarCity has prompted 4 Tesla shareholders to file lawsuits against it, which will likely result in increased expenses (e.g., costs related to the indemnification of the directors) for Tesla. The prohibition of direct sales by automakers and mandatory use of franchised dealers in certain U.S. states negatively impacts Tesla’s sales. Tesla employs direct sales only. Relatively high prices of Tesla models have resulted in low market penetration. Fixed expenses such as marketing costs and R&D increases are becoming more pronounced because of the reduced sales volume. High operational expenses make Tesla look vulnerable compared to large-scale manufacturers such as General Motors and Ford. The absence of sufficient charging points is a major hindrance for the potential buyers—and that impacts the international expansion of Tesla. Over the last year, TSLA returned +32.55%. This return is higher than Auto Manufacturers industry (20.38%), Consumer Goods industry (7.65%), and S&P 500 (15.30%) returns. Are you looking for the analysis of Tesla Motors, Inc. (TSLA) stock? Are you wondering what the bulls and the bears say about it? If so, you came to the right place. In this stock guide, we will share with you 6 reasons to buy and 10 reasons to sell TSLA stock. You’ll get a perspective on what the bulls and the bears say about it. Is TSLA a buy or a sell? Should I sell or hold TSLA stock today? Is TSLA a good buy / investment? What are TSLA analyst opinions, recommendations and ratings? 1. Tesla is the first among automakers in terms of customer satisfaction. 91% of Tesla owners said they would purchase the same vehicle if they had it to do all over again. That result was 7 percentage points ahead of its next closest competitor. 2. Tesla is phenomenal at low-cost marketing. Everything Tesla does is covered in excruciating detail by media outlets, which provides the firm with a great amount of free advertising. Elon Musk personally has 14.4 million Twitter followers. It's really easy for Tesla to quickly get the word out when new products are launched and drum up huge amounts of demand (e.g., 400K Model 3 pre-orders). 3. Tesla is a beloved brand. Tesla has been selling products for barely a full decade (the Roadster launched in 2008), but the company has already managed to get onto Interbrand's list of top 100 global brands. The name "Tesla" is already worth billions of dollars. 4. TSLA stock price ($270.54) is close to the 52-week low ($258.57). Perhaps now is a good time to buy? See TSLA price chart. 5. TSLA quarterly revenue growth was 119.70%, higher than the industry and sector average revenue growth (4.17% and 4.40%, respectively). See TSLA revenue growth chart. 6. TSLA average analyst price target ($325.50) is above its current price ($270.54). See TSLA price target chart. 1. Despite increasing sales, Tesla remains a loss-making company. It incurred loss in all the four quarters and full-year 2016 and 2017. 2. Tesla is facing supply chain problems which are restricting its ability to increase production. Since it depends on single-source suppliers for many components, the inability of these suppliers to increase volume to meet Tesla’s rising demand limits the automaker’s expansion and capacity augmentation plans. While the company is steadily increasing production, the demand is rising at a much faster pace. 3. Other factors affecting Tesla’s results are high research and development (R&D) and selling, general and administrative (SG&A) expenses. Tesla is investing heavily in increasing production capacity, the development of Model X and Model 3, and the Gigafactory construction. It is also expanding sales, services and Supercharger infrastructure. Both R&D and SG&A expenses increased year over year. 4. Investors are skeptical of Tesla’s SolarCity purchase, since the company is already struggling to cut its losses. Investors believe that the problem may be further exacerbated by the addition of SolarCity’s losses. Moreover, the addition of the SolarCity's debts and cash outflows will increase the strain on Tesla’s financials. 5. Tesla caters to a niche market segment. Apart from the limited demand for electric cars, the high prices of the company’s cars result in low market penetration. Moreover, the low sales volume leads to a high per car cost for fixed expenses such as marketing costs and R&D expenses. 6. The low number of charging stations is a deterrent for potential buyers of Tesla. Although the company is working toward developing a supercharging network, the number of charging stations still remains drastically low compared with gasoline stations. Thus, Tesla car owners, particularly the owners of the lower-range version, have to take significant detours to charge batteries. 7. TSLA profitability is declining. The YoY profit margin change was -7.04pp. See TSLA profitability chart. 8. 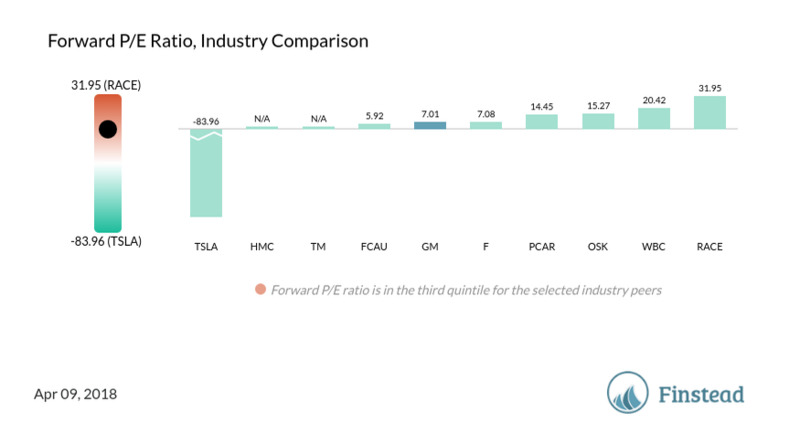 TSLA forward P/E ratio is 32.02, and it’s high compared to its industry peers’ P/E ratios. See TSLA forward P/E ratio chart. 9. TSLA Price/Book ratio is 10.14, and it’s high compared to its industry peers’ P/B ratios. See TSLA forward Price/Book ratio chart. 10. TSLA short interest (days to cover the shorts) ratio is 3.8. The stock garners more short interest than the average industry, sector or S&P 500 stock. See TSLA short interest ratio chart. What are your thoughts on TSLA?